TVS Jupiter price starts at Rs.52,123 (Ex-Showroom, Delhi) and the top end variant TVS Jupiter ZX Disc is priced at Rs. 57,623 (Ex-Showroom, Delhi). The Jupiter gets a 109.7cc air-cooled motor which makes 8PS of power and 8Nm of torque. It features a telescopic fork setup up front and gas-charged rear monoshock, riding on 12-inch alloys. The performance of the 130mm drum brake at both ends are enhanced by Sync brake system, which is essentially a combined braking system. You also get a front disc as an option in the premium variants like ZX, Grande and Classic edition. Fuel tank capacity stands at 5 litres while the scooter tips the scales at 107kg, kerb. 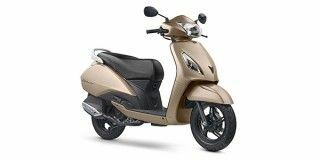 Q. I am planning to buy a scooter so please suggest me which is the best scooter in terms of performance, mileage and looks? See it all depends on budgets, you planning to buy on cash or EMI? Q. Which scooter is best today in mileage price and performance Activa 5G STD or Jupiter basic model? Q. How about suspensions, is it suitable for short girls? Q. How much Under Seat storage space available? It can comfortably accommodate an Open face helmet.